Increase your Internet speed with some of the following tricks without any investment Just optimizing your Operating System. First of all your Operating System must be virus free this can be done using Good antivirus. Virus and Malware slow downs your internet connection and automatically start downloading file and infect your whole operating system. Always keep your system clean and fast . Whenever you create something this will create a temp file which will be stored in temp folder. This temp files should be deleted if they are not used . So remove unwanted and temp file which will make your computer faster. Delete all Temporary file and Clear all browser History Specially Cache which will increase your Browser Performance. 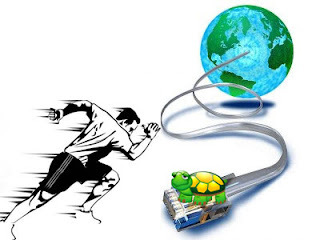 Reduce the Add-ons on Internet browser, which will speed up your Internet as well as browser performance. STEP 1:- Goto Start > Search > and Type Run> and Type "regedit" . STEP 2:- Go to HKEY_LOCAL_MACHINE > SOFTWARE > MICROSOFT > Internet Explorer > Main > FeatureControl > Feature_MAXCONNECTIONSPER1_0SERVER > right click in the right hand pane select new > DWORD (32-bit) Value name it "iexplorer.exe" double click on it and select "Decimal" and enter a number up to 15. STEP 3:- Now Restart your System and check your Internet Speed. * Upgrade Your Internet service Plan which will speed up your connections. *Upgrade your network adapter or router such as Wi-Fi Router.